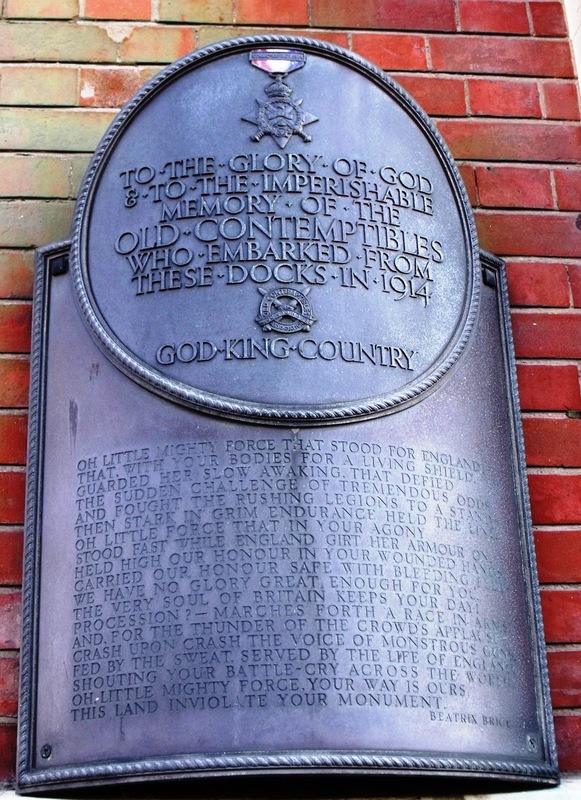 Bronze memorial plaque dedicated to “The Old Contemptibles” who sailed from Southampton Docks in 1914. Located at the crossroads of Platform Road and Central Road on the building to the right of Dock Gate 4, Southampton Docks. The plaque was unveiled on 9th April, 1950. Poem inscription is by British war poet Beatrix Brice Miller (1877-1959) and is reprinted in full below. ©Come Step Back in Time. Oh little mighty Force that stood for England ! Then stark in grim endurance held the line. The very soul of Britain keeps your day ! Shouting your battlecry across the world. Regular readers will know my penchant for finding unusual historical objects. I recently came across the above bronze memorial whilst taking a Sunday stroll along Southampton’s waterside. I stood reading the poem inscription by Beatrix Brice Miller and was intrigued to find-out more about the plaque’s back-story. Why was this memorial plaque commissioned in the first place? Before embarking upon my research quest, I first needed to correctly identify the memorial. I consulted the War Memorials Archive (managed by the Imperial War Museums) which is easy to use and publicly available on-line. Armed with dates, facts and figures, I then spent several months conducting further research which included visiting local archive collections. Finally, I had answers to all three questions. I am glad this object piqued my interest, the back-story is really rather fascinating. Who Were “The Old Contemptibles”? In August 1914, Southampton was designated No. 1 Military Embarkation Port under the command of Major General Charles Guinand Blackader (1869-1921) CB, DSO. By the end of November 1914, Southampton had embarked 359,417 officers and men to the Western Front. At midnight on 12th August, 1914, staff at the London General Headquarters of The British Expeditionary Force (B.E.F.) were requested to report to the Polygon Hotel, Southampton before embarking the following day for Le Havre. On August 13th, Lieutenant General Sir James Grierson (1859-1914) and Field Marshal Sir Douglas Haig (1861-1928) arrived at Southampton’s Dolphin Hotel. Apparently, Haig’s sister, brother-in-law, Chief of Staff, John Gough and two aides-de-camp also arrived at the Dolphin the following morning and partook in a ‘sumptuous champagne lunch’. Later that evening the military men embarked on the Comrie Castle bound for Le Havre. Southampton become an important gateway to the Western Front. The Dolphin Hotel, Southampton. ©Come Step Back In Time. In 1914, the B.E.F. were made-up of seven divisions of British regular army and reserves. The B.E.F fought at the battles of Mons, Le Cateau, Aisne and Ypres. On 26th December, 1914 the B.E.F. were divided into First and Second Armies (further divisions were created later on in the war). B.E.F. remained the official name of the British Army in France and Flanders throughout World War One. Kaiser Wilhelm II (1859-1941) is thought to have made a number of dismissive comments about the B.E.F. including the infamous Order, issued on 19th August, 1914 (the original of which has never been found), to: ‘..exterminate the treacherous English and walk over General French’s [Field Marshal John J. P. French – 1852-1925] contemptible little army.’ Survivors of the B.E.F. decided to call themselves and their post-war veterans’ association, “The Old Contemptibles”. For more information about the truth and myth behind this nickname, see the veterans’ website. To qualify as an “Old Contemptible” the soldier would have to have seen active service actually in France and Flanders between 5 August and 22 November 1914. For this he would qualify for the medal known as the 1914 Star. This medal was introduced in 1917. In 1919 a clasp bearing the qualifying dates was authorised and given to soldiers who had actually been under fire between those dates. It was also known as the “Mons Star”. At the very top of Southampton’s memorial plaque, there is a relief detail depicting the “1914 Star”/”Mons Star”, identifiable by its distinctive colours of red, white and blue. Who was Beatrix Brice Miller? Beatrix was born in Chile, South America in 1877. Her mother was Kent-born Mary Louise Brice Miller (née Walker). Beatrix enjoyed all the trappings of a privileged upbringing, including a private education. When her father died, she moved back to England where she lived in Goring-on-Thames. When World War One broke-out Beatrix, who was now in her late thirties, travelled to France alongside her mother to serve with the B.E.F. The women became Red Cross VAD ‘Lady Helpers’. They were amongst some of the first women to arrive in France at the start of the War. They would have had to obtain special permission from the War Office to make such a journey. Travelling to France was a dangerous experience, even in the early days of the War. Brice Miller and her mother sailed across the Channel and continued their journey by motorcar. Women who undertook these self-funded trips, were usually from very wealthy and influential backgrounds. The experience had a profound effect on Beatrix and when the War ended she dedicated herself to supporting “The Old Contemptibles”. Brice Miller was a prolific writer and highly regarded poet. Her first poem, ‘To the Vanguard’ was published in The Times on 2nd November, 1916. The poem was written to remember the first soldiers who went to fight in France in 1914. This is the poem that features on the Southampton memorial plaque. Brice Miller also organised a commemorative event at the Royal Albert Hall in 1917 with General Sir William Pulteney (1861-1941) GCVO, KCB, KCMG, DSO to honour the B.E.F. In August 1939, the BBC broadcast a documentary that Brice Miller had worked on several years earlier. The programme explored B.E.F’s involvement in World War One, particularly in relation to the fighting which took place from Mons to Ypres. Brice Miller died on the 25th May, 1959, aged 82, 9 years after the unveiling of “The Old Contemptibles” memorial plaque. Bare your heads and stand aside ! Swinging grandly down the way. Salute the men who died. Re-echoes from the farthest post. Till throbbing heart, and will respond. To track their unseen feet. We know our strength, the Souls of men. On every shell swept field. Bare your heads, and stand aside! Immortal, though for you they died. Across thy heart they’re marching past. And Paris lies before her foes. Of the odds that face us here. But we’ve pulled the army clear. My guns, O my guns ! Steady to be slain or slay. And we’ve saved the Force to-day. So we can’t get up the teams. To break through and bring the teams. And the orders to retire. Left, the havoc they have wrought. By the dead with whom you fought. And a laggard land at bay. The fresh flung horde of hell. Reckoned in sums per hour. They fought and by God they won ! In the land where the vanguard fought. An Epic That Will Never Die – Great day at docks or Old Contemptibles. Nearly 36 years ago, the men described by the Kaiser as a “contemptible little army” marched through the gateway of Southampton Docks on their way to France. Many who had not set foot in the town since then came back to the Docks yesterday afternoon to revive old memories, when a commemorative tablet was unveiled to recall the sailing in 1914 of the Old Contemptibles. “The Old Contemptibles” memorial plaque was unveiled on Sunday the 9th April, 1950 on the side of the former Docks’ Post Office and Telegraph building, Southampton Docks. It is mounted on the front of the building which stands at the entrance to Dock Gate 4 (the same location where the Titanic sailed from in 1912). It is through this Dock Gate that “The Old Contemptibles” marched in August 1914, en-route to the Western Front. The suggestion to erect this memorial was first made before World War Two by Hector Young, O.B.E., J.P. Young was patron of the Southampton branch of “The Old Contemptibles”. The last remaining survivor of the 1914 Christmas truce and an “Old Contemptible”, Alfred Anderson, died aged 109 in 2005. In April 1950, over six hundred veterans from the association were in attendance at the ceremony and the plaque was unveiled by Admiral of the Fleet Sir Algernon Willis, G.C.B, K.B.E, D.S.O, R.N. (1889–1976). The association paid for two-thirds of the plaque and one-third was paid for by Ms Beatrix Brice Miller. Brice Miller was also part of the unveiling ceremony. It must have been a proud and poignant moment for her to be able to witness such an occasion. Thirty-six years ago they were the officers and men of the B.E.F. on their way to France and Belgium, to take their place on the flank of the Allied battle-front. They covered themselves with glory in the late summer and autumn of 1914, and played a decisive part in checking the advance of the German hordes. In particular, the B.E.F. saved the Channel ports. Had those ports fallen into enemy hands the threat of invasion would have been very real. 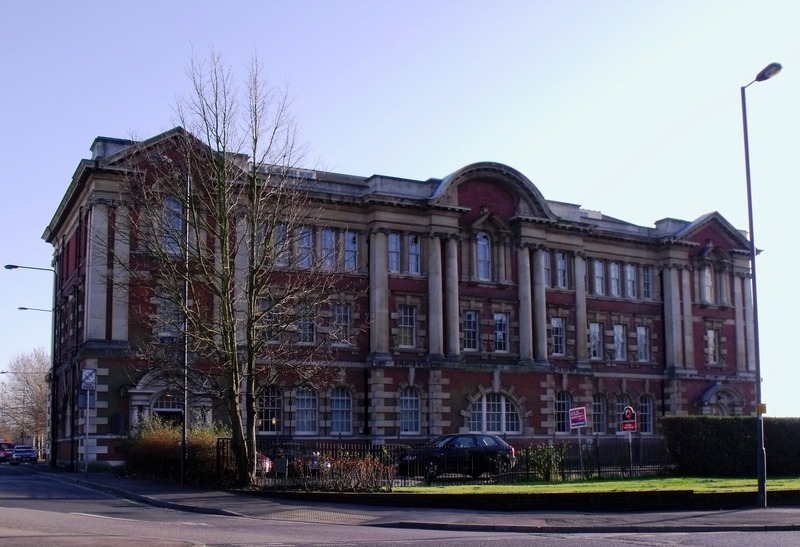 The former Southampton Docks’ Post Office and Telegraph building, south side of Platform Road, Dock Gate 4. The memorial is located on the front of the building. ©Come Step Back In Time.